LEXINGTON, Ky. (Dec. 22, 2014) — In 1987, the UK colleges of Education and Allied Health, now called Health Sciences, and the Center for Biomedical Engineering formed a collaborative Biodynamics Lab to study sports injuries and rehabilitation. Building upon this rich history of helping athletes prevent injury and increase performance, today the lab has a new location, extensive new equipment and capacities, and a new name: the Human Performance Lab. The new Human Performance Lab provides a state-of-the-art teaching and research facility not only for assessment of form during movements such as running and throwing, but other kinds of functional assessments as well, including strength, endurance, gait and balance. These types of assessments are critical to better understand functional movement and conduct more sophisticated movement and exercise studies in fields beyond athletics and injury, such as healthy aging and neurological disorders. Robert Shapiro, Ph.D., associate dean for research and innovation in the UK College of Education, has directed the lab since its inception. Charlotte Peterson, Ph.D., associate dean for research in the College of Health Sciences, serves as co-director. 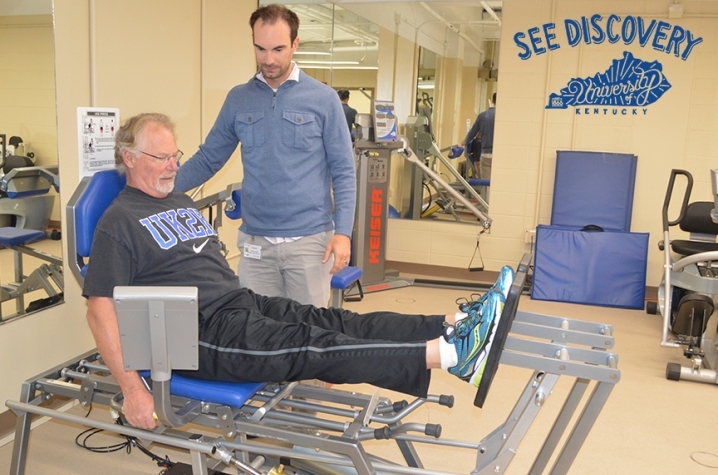 "The new space and equipment of the lab lets us expand beyond the athletic population, to include, for example, Parkinson's patients, 'pre'-habilitation, and aging issues," said Peterson. "The sorts of research projects that we want to highlight are those related to some of Kentucky's biggest health challenges — obesity, diabetes, and functional status in the elderly. We're interested in new ways to help people improve quality of life and maintain functional independence." The dedicated space for exercise studies, including separate exam rooms, is also a benefit to research participants. "Exercise and physical activity studies don't always need participants to come to the hospital, and the lab creates a non-clinical environment that's a little more like going to the gym instead of going to the hospital," said Dr. Philip Kern, director of the Barnstable Brown Diabetes and Obesity Center and the Center for Clinical and Translational Science. The expanded capacity and resources of the lab not only support current research but also serve as a catalyst for new multidisciplinary collaborations and translational research. For example, the College of Health Sciences, the Department of Neurology in the College of Medicine, the Sanders Brown Center on Aging, and the Center for Clinical and Translational Science jointly purchased a GAITRite, which analyzes how a person walks, for the Human Performance Lab and will be used for pre- and post-testing of Parkinson's patients following deep brain stimulation surgery. The lab also provides unique research opportunities for undergraduate students. There are currently around 1,000 undergradguate students majoring in exercise science at UK, all of whom will take a course that involves working in the lab. Peterson hopes that in addition to expanding current research opportunities and involving students in research, the Human Performance Lab will prompt increased consideration of functional assessments across the spectrum of health research. "Ideally, this facility and expertise will encourage researchers to think more about incorporating functional assessments and physical activity interventions into their research programs," she said. To learn more about participating in research and to stay up-to-date about health research opportunities at UK, please visit www.ukclinicalresearch.com.